Germany has imposed travel bans on 18 Saudi nationals suspected of having links to the murder of dissident journalist Jamal Khashoggi at the kingdom’s diplomatic mission in Turkey’s Istanbul early last month. German Foreign Minister Heiko Maas made the announcement on Monday, saying the 18 Saudi citizens had been banned from entering the country’s territory as well as Europe’s Schengen passport-free zone over Khashoggi’s killing. “As before, there are more questions than answers in this case, with the crime itself and who is behind it,” Maas said on the sidelines of a European Union meeting in Brussels, adding that he had discussed the decision with his British and French counterparts prior to the announcement. Berlin has “decided that Germany should impose an entry ban on 18 Saudi citizens, who are presumed to be in connection with this deed, in the Schengen information system,” Maas told reporters. Mass’ office later announced that it could not release the names of those sanctioned Saudi nationals due to Germany’s privacy laws, but said the members of the 15-strong squad accused of carrying out the killing and a further three suspected of organizing the brutal act had been given entry bans. The Schengen Area comprises 22 EU countries and four non-EU countries. Britain is not part of the passport-free Schengen zone but shares intelligence through Shengen Information System (SIS) for law enforcement purposes. Germany has already imposed a ban on selling weapons to Riyadh until the circumstances of Khashoggi’s killing are fully cleared up. The United States also imposed economic sanctions on 17 Saudi nationals last week, including suspected members of the alleged hit squad and senior advisers to Saudi Crown Prince Mohammed bin Salman – who is alleged to have been involved in the killing of the 59-year-old critic. US media reported on Saturday that the US Central Intelligence Agency (CIA) believed with “high confidence” that the Saudi crown prince directly ordered the killing. 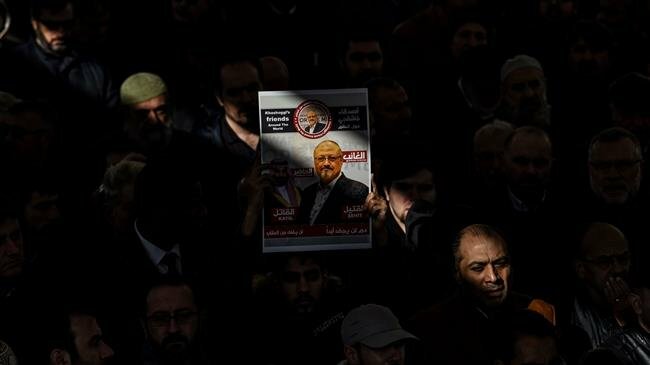 Saudi Arabia is facing global criticism over Khashoggi’s killing inside the Saudi consulate in Istanbul on October 2. The 59-year-old was seeking to secure documentation for his forthcoming marriage when he entered the Saudi consulate, but never came out despite Riyadh’s initial claim that he exited the mission less than an hour after completing his paperwork. The Saudi kingdom, after denying the murder for several days, finally admitted that Khashoggi had been killed in the consulate during an interrogation by rogue operatives that had gone wrong after diplomatic pressure grew tremendously on Riyadh to give an account on the mysterious fate of its national. However, Saudi Arabia said that it did not know the whereabouts of Khashoggi’s body, which is widely believed to have been dismembered. Turkish President Recep Tayyip Erdogan has said the assassination was ordered at the “highest levels” of the Saudi government, but stopped short of pointing the finger of blame at the crown prince. Turkey wants the 15-man team that it says killed the journalist to be tried there.